Sometime back I had written an article - JET - custom event wrappers - on how to add some custom information to an event raised by a component and then throw the event wrapped under your own custom event. This article is just an extension of the same thought, which demonstrates how effectively you may use the above concept to solve your problem. We have an oj-chart component, which has a context-menu. Depending on the bar or pie slice which fired the context menu, we need to capture the chart data and act accordingly when the user clicks on any of the menu options. However, the action event (on-oj-action) from oj-menu does not capture any information regarding the chart series or group. But, oj-menu has a beforeOpen event (on-oj-before-open), which fires just before the context menu pops up and, more importantly, which captures all the data that we need. So how do we make use of this event to solve our problem? Step 1: Context menu fires beforeOpen event. We get chart related data from this event. Step 2: We store the chart data in a variable. Step 3: Context menu option click fires action event. This event is captured, the extra information is attached from the variable in step 2, and thrown again as a custom event. This custom event now has all the data from the chart, which was captured from a different event. All we did was to combine the data from the two events. 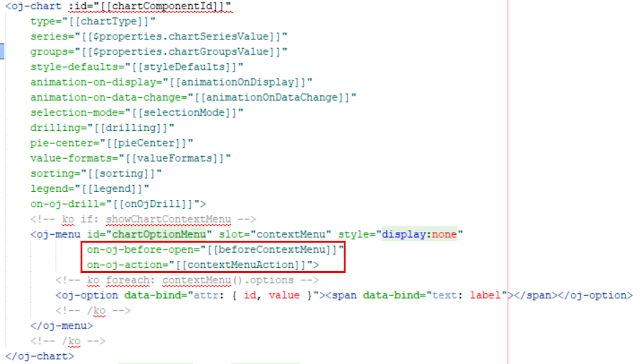 When the user finally clicks on one of the options in the context menu, we see that the chart details have now been captured in the detail part of the custom event, which were not present in the native event.